I’m not a big planner. I know there are bloggers out there who shoot 3 amazing dishes on Sunday and then have food prepared for the rest of the week. Meal planning is a wonderful thing. It’s clever and it’s efficient. I want to be like these organised, roll-your-sleeves-up people, I really do. But part of growing older is to be comfortable with who you are, right? And I am a chaotic, messy last minute dinner maker. That’s how I roll. Just like the sun shines occasionally in London, sometimes a fish pie with cauliflower mash materialises before midday and an unforeseen photo opportunity presents itself. Honestly, I don’t know what came over me yesterday. Normally I have eggs and spinach for lunch. Or spinach and eggs. Or leftovers from the night before. If there’s none of the aforementioned, it’s anything else I can find in the fridge that I can throw in a bowl and mix up without cooking. Fish pie? Gasp! It wasn’t even Friday! There you go. Life is full of surprises. And when inspiration strikes, just go with the flow and keep your forks at the ready. Now, let’s talk about this fish pie. just like your Grandma used to make it only better, because….. it’s low carb! 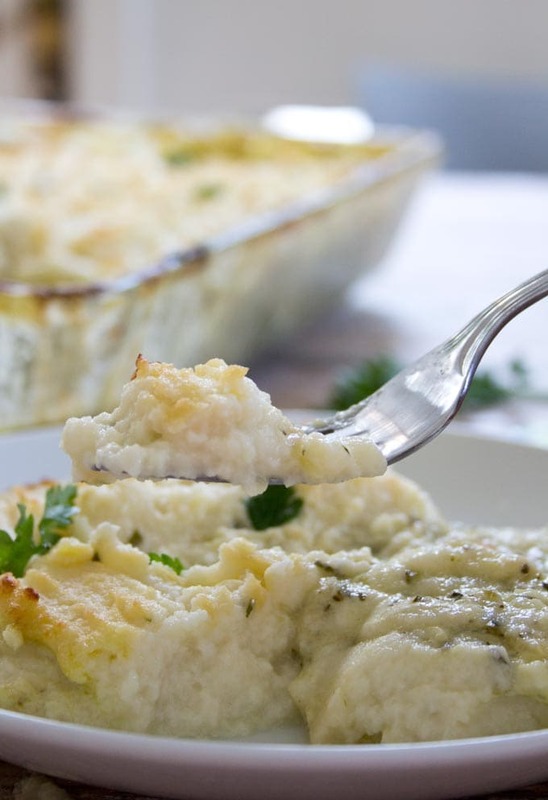 If you have not tried making cauliflower mash yet, let me tell you. IT FOOLS EVEN CHILDREN. Honestly. “I like the potato mash on top”, announced my daughter. True story. Cauliflower is the one vegetable that benefits from being largely tasteless when cooked. It’s like a blank canvas, a food chameleon. It can be anything you’d like it to be. Pizza crust, chocolate pudding base (I’m not making this up), “potato” mash. Just add some cream, spice, cheese… and let the magic happen. 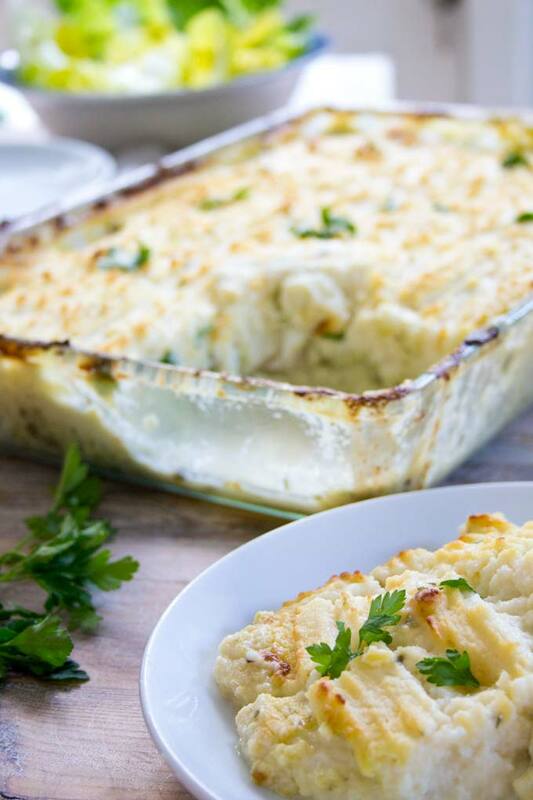 As a guideline for this fish pie, I used a couple of recipes from Vickie De Beer’s amazing Low Carb Diabetes Cookbook. It’s one of my favourite cookbooks and I’ve tried and adapted many of the recipes, such as my almond cream cheese pancakes, which is to date the most popular recipe on Sugar Free Londoner. If you enjoy leafing through a cookbook for ideas, this is the one to get, whether you’re diabetic or not. As you can see, these the pics are as honest as they come. This fish pie was piping hot when I photographed it, because I WANTED TO EAT IT as soon as possible (and I did). One of the secrets in food photography is that casserole portions remain in beautiful photogenic rectangles when cold, and I admit, when I transferred the leftovers into a smaller dish at the end of the day, they looked rather perfect. 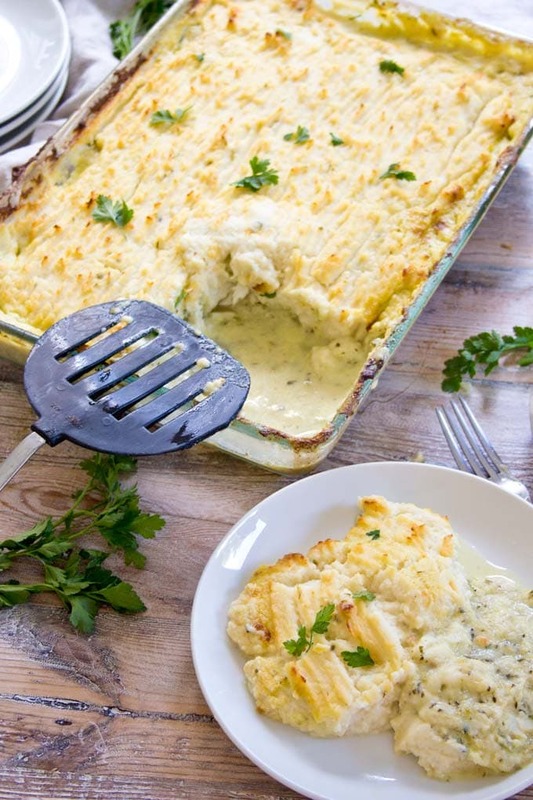 Alas, this is exactly what your fish pie will look like when you serve it straight from the oven – a little messy, a little floppy and utterly delicious. You can eat it with a green side salad, if you wish, or just tuck in. It is really filling, so you might have leftovers for a couple of days to come. Tried this ketogenic fish recipe? Give it a star rating below! 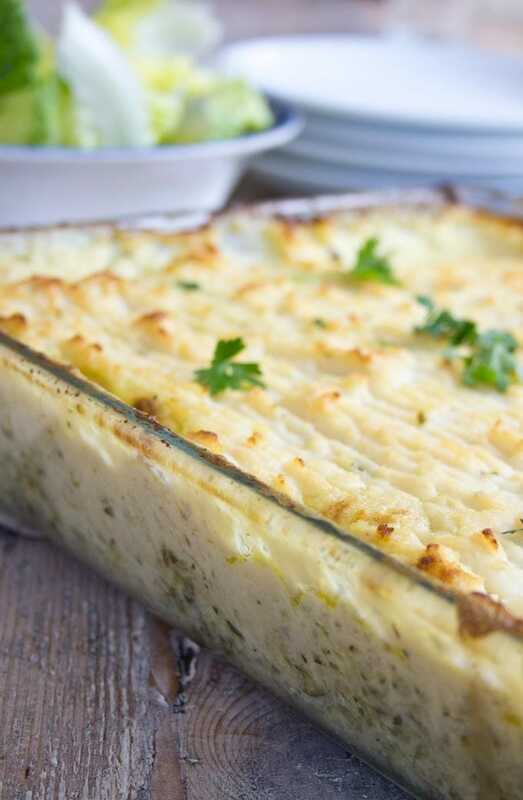 Comfort food at its best - a deliciously creamy fish pie with cauliflower mash topping that will make you come back for seconds! Separate the cauliflower into florets and steam or boil until soft. Drain well!!!!! In a separate frying pan, fry the onions and garlic in olive oil until soft, around 3 minutes. Add the courgettes, cream, lemon zest and herbs and simmer for 5 minutes. Put the fish fillets in a casserole dish and pour over the sauce. Spread the cauliflower mash on top and run a fork over the top to make lines. You can use a mix of white fish or even salmon and add prawns. All work well. Adding celery and fennel to the sauce taste good, too. Don't miss out on the lemon zest. It really makes the recipe!! I have some cod in the freezer and didn’t know what to do with it. Now I know what I’m going to do with it. Can you tell me what size casserole dish you used? I live in Arizona… USA… Thanks for the recipes you have converted to low carb. Hello there, I used a 13 x 9 inch casserole dish. Hope you’ll try the recipe! I found your site at Xmas and decided I was going to supplement your low carb recipes as an evening meal with my milkshake diet, after a week of trying your very tasty recipes I got rid of the milkshakes and went with just your recipes, I’ve lost 14kg since Boxing Day, I’m a definite convert, your recipes are tasty, easy to do and very filling!!!!!! 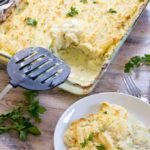 Your fish pie is most definitely my favourite however (the point of this message) can I use single cream instead of heavy cream? You must be so happy – 14 kilos, amazing! I think you can use single cream, but as it’s more liquid you may want to use a little less / reduce the sauce a bit more to make up for this. Hi Julie, I’m sure you can use the same fish again, just make sure you reduce the liquid more before putting it in the oven! Hi again, I forgot to mention that I have a keto lifemeal now. I would love more one pan meals. Bye for now! I have never heard of fish pie, but it sounds really good. I love fish!!! I will be trying it this week. Hello Katrin! I love your recipes and I’m very new to your site. I am writing you from California in America! It seems that I’ve seen in other recipes from you that there was a button to push to change the measurements from Metric to Imperial. Am I correct or confused? Lol! I was hoping to find the conversion button, but wasn’t able to find it. Not a huge crisis, but I was wondering. Thanks much! Hi Christina, glad to have you here! I use the same recipe plugin for all recipes, so all should have the same features! I think the toggle is only there to change the amount of portions. Tell me – are you looking for ounces? Can I ommit/sub the white wine? How about substituting broccoli for the zucchini? will that affect the nutritional number by much? The great thing about zucchini is that it has a very mild taste. It gives the sauce substance and thickness but does not overpower it. I think you would be able to taste the broccoli. That’s not a bad thing if you like broccoli and it could definitely work. In terms of nutrition, I think it would not make much difference. Both veggies are really healthy and low in carbs. Me likey, likely – cannot wait to wrap my laughing gear around a heaped spoon of this luscious sounding fare. Thank you for the inspiration on this great Monday. I made your fish pie on Friday for lunch. It was super. Am still eating it today Sunday. I used leeks which went well with your recipe. Thank you for posting this. Am Looking forward to trying more of your recipes. Thank you for your comment Mary. I can imagine that leeks would go well with the pie, sounds great. I’m more of a Shepherd’s Pie person, but this looks like i need to give it a go. Can you use single cream instead of double cream? Glad I put it out there 🙂 Hope you’ll like it! Brilliant! What a nice twist to add the egg. It’s often used in fish pies. Thank you for this recipe! We had the most amazing dinner last night. And plenty of leftovers. This dish is filling! So happy you all enjoyed it. And you are right – this dish is filling. In all the best ways!